EDIT 12-24-16 Option for 5 mm High CRI LED is added (see post # 239) Price is the same, $150 plus postage. Point of clarification. 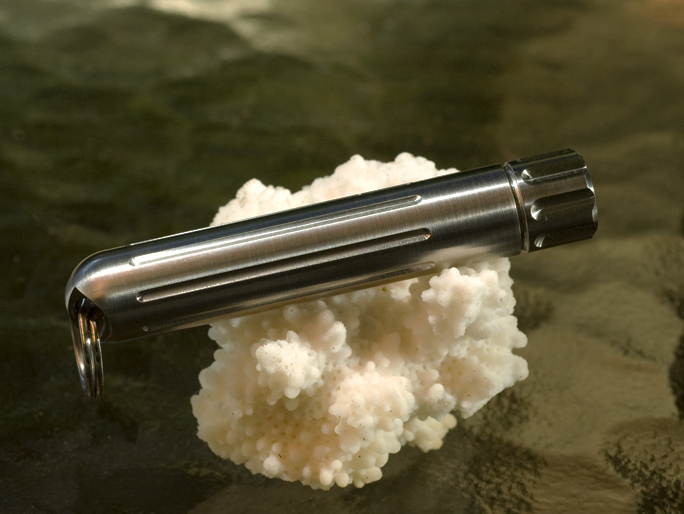 The sapphire 25 does not include a Ti split ring or baby gecko. Further point of clarification. It's not a baby gecko, it's a baby skink. Point of clarification. 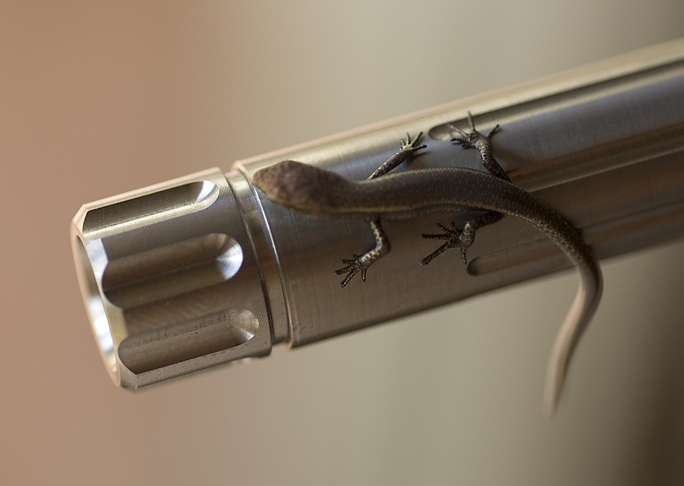 The sapphire 25 does not include a ... baby gecko. What? Aw that's it. No sale! Got mine today. Really nice light - my first Ti light as well! Ow ow OW, okay, I'll take one, just stop twisting my arm already! Don, I think this is the best AAA light of the bunch. Ive had three already and I was just about to order another one but I just picked up Bruce's Sapphire Mule (BRIGHTERISBETTER) on USN today. I feel honored to get to see one as I know they were a real PITA...from your own words...to build. I am glad you started these up again as they are #1 in my opinion for keychain lights! I am "really" impressed with mine. The more I use it the more I like it. My Sapphire 25 arrived in the mail today, and as usual the construction is superb. It occurred to me earlier this week, when someone mentioned that they bought one of these as a "little brother" for their Lunasol, that the Sapphire could also be named the Luna, seeing how similar it is to the Lunasol's "moon mode". Comparing my Sapphire to my Arc AAA Ti, it looks like the aperture behind the lense is slightly smaller, too small to fit a 5mm LED. Don, would you say this is accurate, or are my eyes playing tricks on me? A 5 mm LED will pass through no problem. I would be concerned that it is possible to have the 5 mm stick up too far and make contact with the window if you aren't careful on how tall the assembly is but it is avoidable. I made a UV sapphire with one of the Nichia 365 nm 5 mm metal can LED's and had to address isolating the can from the head because the can is (+) but no problem. The first of the Arc Ti AAA's were machined by my shop and provided to ARC by me but now they are machining their own in house and I have no idea if there has been any alteration to the original design or not. This first set from ARC (Sapphire origin) was made available with either 3 mm or 5 mm LED's so the fit has been demonstrated. Hmm. Yep, you're right, the 5mm emitter from my Arc AAA Ti fits just fine. The tapered "reflector" around the sides of the emitter looks like it's a little thicker on my Sapphire, like the opening for the emitter is slightly smaller, and I think it actually is, but I guess its due to the opening on the Arc AAA Ti actually being slightly larger than it needed to be, not the other way around. Don, I'm a little confused, in the other thread you mentioned that an interference fit against the 3mm led was holding the LE in the head? Did I misunderstand what you were describing? I was wondering about that because it occurred to me that different leds might have different profiles. I have plenty of these left and hope to order more converters and Ti sets as needs dictate. I really believe in the merit of this light and hope to continue with it. The market will make the final decision on this one. I believe anyone, even a devout non flashaholic, can derive utility from a small key chain light and especially one that is indifferent to the abuse and mere occasional use it might be subjected to. I have gifted some of these to people I know wouldn't carry a flashlight by habit but they do have these on their key rings and do use them when the need arises. Loaded with Energizer lithium AAA's these lights will serve for a number of hours of use even if these hours are spread over months and even years, I suspect. Granted the price is not conducive to any mainstream acceptance at least based on current perceptions of needs. However it is my hope that there are enough people out there who have disposable income that they spend on personal EDC gear and jewelry who might come to realize that in the long run, they can indeed receive utility commensurate with the price. Hopefully they will appreciate the durability, dependability and lack of maintenance needs the Sapphire has to offer; unobtrusive and there when it is needed. A sapphire is considered a semi precious stone and one that is not prone to damage when exposed. It is my hope that this Sapphire light can earn a similar perception. The design is based on a 3 mm LED and the LED has an O-ring around it that has an interference fit between it and the bore of the head where it resides. The ARC Ti AAA heads sporting a 5 mm LED do not have this O-ring in the bore. Don, I certainly am not complaining about the price of the Sapphire. Yes of course it's more expensive than a mass market light, but as someone who enjoys and appreciates these things I feel that it's well worth it. As you know I've bought several even more expensive lights over the years and have been enjoying them a lot. By "holding out" I just mean that I have personal financial ups and downs because of external factors, and I tend to only buy nice lights during the "up" periods. Right now I'm in one of those times when I try to be a bit more careful with expenditures, so am waiting for a period when I have more $$$ coming in. This is normal and nothing to worry about. I didn't understand earlier about the O-ring. Thanks for the explanation. My Sapphire 25 has been on my keyring for a little over a month now and it is serving me very well. Yesterday I was taking my keys out of my pocket and they fell, in trying to catch them I only batted them up about chest high and 3 feet away, they landed hard on the asphalt. The first thing I did was inspect the Sapphire and there was not a scratch or dent to be found, I twisted the head and it lit right up. Sorry, much of my rambling was in general and not directed at you specifically. I was queried if these are still available. Yes, they are. If I run out or get caught short on component supply, I will so advise in this thread. Hopefully you don't run out before I get a bite at the apple! The Sapphire is one of those things that cannot be measured in millimeters, lumens or runtime. It's simply fantastic! I agree. Mine have been on my keychains since new, and have been dropped, kicked, beat up, etc. Still look great, albeit with much "character", and continue to run flawlessly. The beam must be seen to be believed, compared to other keychain lights. Smooth, even, floody, and more than enough light. 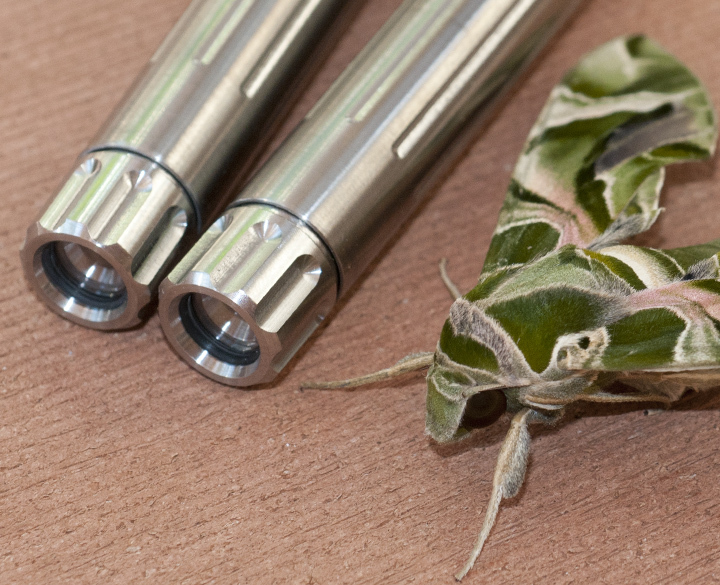 Wet or dry, probably the easiest to turn head on any light I own, with the deep grooves on the head. I don't think Don could have done better. I have had mine for about 2 weeks now. 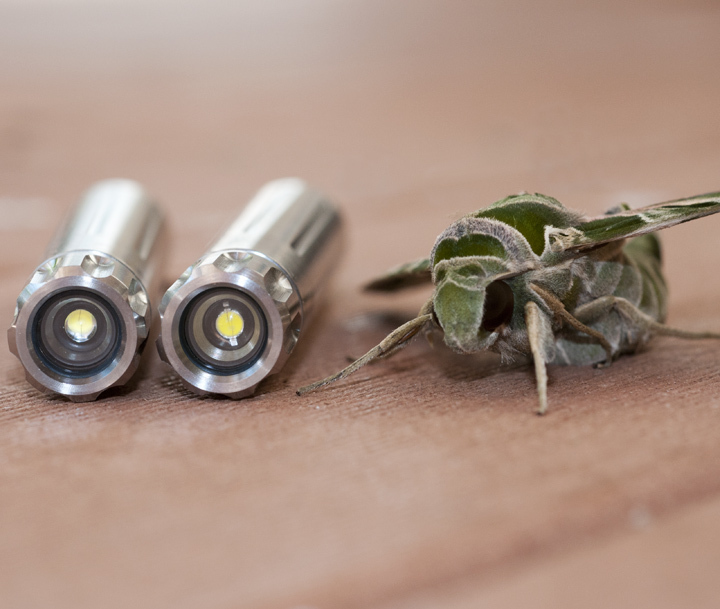 I wanted one of these little buggers since they first came out but couldn't understand the cost vs. lumen factor. I waited until I reached the level where I knew I would appreciate such a light, and I finally get it. It's not about the lumens. It's about the craftsmanship, the smooth floody beam, the runtime, the feather weight, the convenient size (it's smaller than it looks), and the timeless design. Yes, it's my newest light. But it has become my favorite EDC and I cannot see myself ever being without it. I sure hope these are still available. Email has been sent. Hi LocalGuy and welcome! Your light will ship out today. Holy Geez...I can't thank you enough! I've never had an EDC flashlight before, that wasn't mounted to something or in a pouch. Never knew about the wide world of flashlight modification and custom creation. I couldn't have started this new journey with a better impression or light than with the McGizmo Sapphire 25.